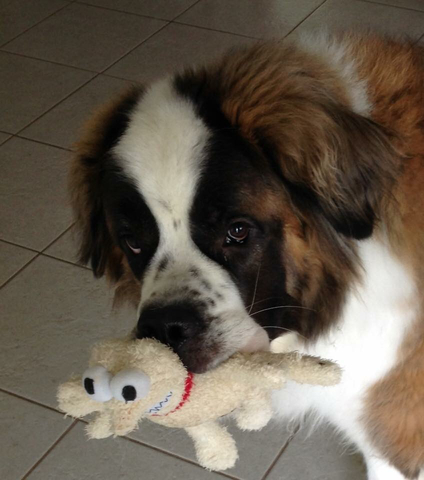 PINELLAS COUNTY, Fla. — A 202-pound St. Bernard that was missing since Monday from a Treasure Island home was found dead on Friday, according to a pet detective. In a Facebook post, Private Investigator Jamie Katz said, "It is with a heavy heart that I announce Logan's body has been found deceased in a neighbors nearby bush. We do not know how Logan got outside but the family now has closure. Our sincere condolences go out to Logan's family, Will & Jamie, this is never the outcome we hoped for." Logan was seven years old. The family initially filed a police report with the Treasure Island Police Department because they believed someone went in through an unlocked back door of their home to take the dog. It has not been clear whether or not Logan got out on his own. William O'Shea had initially said that Logan could only be outside for a short time because of his weight, and hair. He also had special meals he ate and needed to be in a certain temperature inside with an air conditioner. At this time, an official cause of death has not been released.